Serve your signature red and white wines in this Acopa 11 oz. all-purpose wine glass. Featuring a thick construction, this glass is ideal for rigorous, high-traffic environments like pubs, restaurants, and lounges. Its thick, rolled rim ensures excellent chip-resistance, and the bowl allows room for swirling while remaining relatively narrow at the top, making this all-purpose glass suitable for any kind of wine. 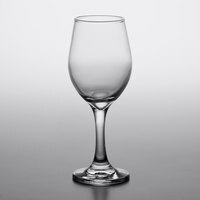 It's an excellent option for establishments that only want to stock one type of wine glass. It’s been over 3 years that I’ve purchased these glasses and they’re still holding up. We entertain a lot so I’m very happy with the purchase . These beautiful wine glasses make a spectacular statement whether you are using them to entertain or just enjoying a sip or two in the evening. I am so glad I purchased these and may order more for the upcoming Holiday Season. We use these wine glasses when we cater events at our wine bar. They are sturdy and look nice. We would use them for our elegant events, but they work great for big catered parties. We love our new glasses. They are steady and look good. I think we are selling more wine and the glasses dont break when washed. perfecto para el uso que se necesite vino blanco o rojo lo recomiendo por que es economico y muy presentable para cualquier ocacion gracias mil. These are definitely the new standard for my restaurant - we serve reds and whites in them. They are much studier and classier than the cheapo wine glasses I used to use, and these are a great price! These glasses are nice and also thick, which works for our pizza place since we’re not trying to be very fancy but for a more upscale restaurant you may want to choose a thinner more elegant glass. However we appreciate the durability in our establishment. These hold up very well. They are thick and don’t shatter like some of the thinner stemmed wine glasses. Not to full or empty looking with a standard glass of wine in them. Decent price and we will reorder! Perfect size wine glass for different size wine pours. Durable and doesn't crack or chip. Easy to clean (lipstick). Case size is perfect for a new opening restaurant. These are an excellent value for the price. The quality of these are good enough that we travel with them for catering events and have no issues with breaking in transit. Good for red or white wines. Good all purpose glasses. can be used for water or juice. they do not feel. that they will brake when you wash or dry then by hand. Glad I bought these Acopa 11oz all purpose wine glasses 12/case. They look great and work well. I love the fact they are sturdy and last long. We are really happy with these glasses. It is very convenient having glasses that you can use for both red and white wine. These glasses are good quality. I use these for restaurant and home use. They are elegant looking and great because you can use them for a 7oz glass or a 9oz glass. There is no need to have 2 different sizes in a busy restaurant/ keeping it simple with these! We've had to replace our entire wine glass inventory numerous times before we found this product. They are nice enough to use in an upscale restaurant but durable to use in a high volume restaurant. Great per piece price, always in stock and we've been using them for 2+ years and they have always shipped quickly and have not been discontinued or shaped slightly altered to not match with other pieces. Have found Acopa products to be of very good quality. These wine glasses are an excellent fit for our restaurant. They are the perfect size and customers love them. We have been purchasing them for the past 4 years and will continue to purchase them. These glasses are the perfect all purpose drinkware. I use them for my catering events and love that I can use them for white or red wine as well as water. Glasses break. A lot. These wine glasses don't break more than normal, but they sure hurt less to replace. They're sturdy and the price is right! We have looked around and tried many different wine glasses but these are the best. They are the perfect size for a 5 ounce pour. These 11oz. wine glasses are elegant. They are exactly what I needed and you cannot beat the price. My customers really like how nice they look and always mention how comfortable they feel in hand, while holding them. Nice job. These glasses were exactly what we were looking for and at a great price too. They clean easily and are very durable. They hold up great in a buisy restaurant. I wish I had bought these in the first place! These are exactly what I was looking for. The shape and weight are excellent for holding and they're not terribly delicate. Ordering, delivery and packaging were perfect. Got these glasses to replace larger thinner white wine glasses and we've been really happy with the look and quality of the glasses. They're not too dainty so they don't crack yet they have a nice presentable look. A nice, heavy duty glass, works well for our catering events. Arrived quickly and intact. Looks nice on the table, but a little difficult to polish. I loved this wine glass, really easy to clean. Sized is just perfect. Their elegant style and strong material will be enjoyed by My clients for years to come. From California. We love these all-purpose wine glasses. They are the perfect size and sturdy. We bought some at IKEA and they all broke really quickly. None of these have chipped or broken, even in a move across the country. Talk about some amazing customer service! When my original order was delivered, several of the wine glasses were broken. I contacted customer service and they are sending me replacements! Thank you Webstaurant Store for you excellent service!!! Very nice glass at a very good price. Great to show value of your Chardonnay pours without breaking the bank with high cost glass wear. I bought these wine glasses for my daughters wedding in june I was so please when they arrived . the quality was good the glasses had substantial and felt good in your hands. I ended up buying 18 dozen glasses and they arrived with not one of them broken.After considering what the caterer was charging me to rent the glasses buy them was far less costly . If you need wine glass consider these Acopa 11 oz All- Purpose wine glasses they are nice glasses quality glasses and excellently price. Good looking wine glass and this site sells them for a killer deal too. Would highly recommend - they are very well made glasses. thank you! Unfortunately a few of the glasses broke in transit. Solid glassware though. A bit expensive but I expect it to last foe a long time. All purpose wine using this glass from last couple of months , better with the quality then other cheap glass perfect for wine & other purpose. These wine glasses look great. They are also not flimsy and do not break easy. Very happy and impressed with them. We will be using them from here on out. Great wine glasses. We needed some wine glasses and decided to buy the least-costly ones on Webstaurant - we found these. These look great and hold up well. Only thing to note is that customers in our establishment are far from "wine-snobs", but I know that your average wine-drinker would love these glasses as much as we do! We certainly love the price! These are a great all purpose glass. Just big enough but not too big. Definitely wash them thoroughly because lipstick stains don't wash off easily! The way the box looked when the package came, I expected some of the glasses to be broken. I was amazed and pleased to find all twelve of the all purpose wine glasses were intact, and without a scratch. These sturdy glasses are amazing! I can't be happier with this section. These glasses are designed in a way that they are a good size without being too heavy and easily broken. They can be suitable for white or red wine. I will reorder these as needed. Great prodcut for the price, excellent service and delivery on this item. Pricing can't be beat! no lines in the glasses, easy to clean, great portion control for wine cost. Great for any purpose! Extremely thick and durable! The top is a little narrow which makes it hard to clean deep down if you have larger hands. The smaller/narrow bottom is great for smaller pours. Very nice and cost effective wine glass for anything. Bought instead of renting. I would have paid more for the rental. These look nice and are very durable. Lovely glassware, it is easy to handle and the ladies love the nice clean look. Not to heavy so its easy to handle when full.